The cake for this birthday cake is 8' bottom tier and 6 ' top tier. I carved the cake to have crocked look. 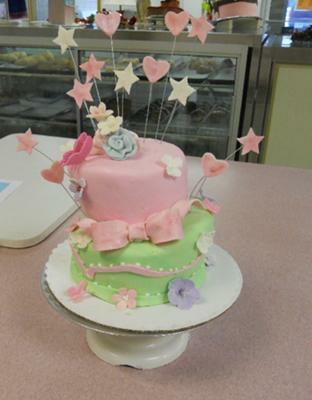 The cake is covered with fondant. The flowers are roses, petunias, cherry blossom and five petal flower. They all are made from gum paste. The butterflies, stars and hearts are made from fondant and I used flower wire to attach some,to give the cake more height. The bow I made from fondant a day in advance, left to dry and I used royal using to placed on the cake. I used edible pearls around the cake .